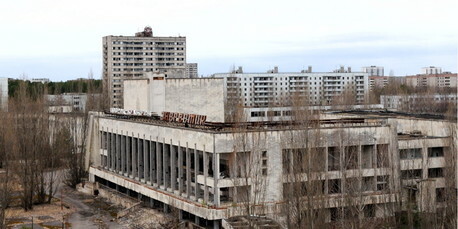 Ghost town of Pripyat in the Ukraine: The residents were evacuated after the disaster forever. Geisterstadt Pripjat in der Ukraine: Die Bewohner wurden nach dem Unglück für immer evakuiert. The doctor Dörte Siedentopf organized recreation for 20 years stays for Chernobyl children. She is bewildered about how it is deal with Fukushima. Dr. Dorte Siedentopf born in 1942 in Oldenburg, school attendance and high school there, and from 1961 studied medicine in Würzburg, Berlin, Gottingen. 1966 examination, promotion 1968th 1967 marriage, two children, then from 1970 in Hesse Dietzenbach active private practice as a physician in general medicine and psychotherapy in community practice. Since 2003, retired. It is (since its foundation in 1981) a member of the IPPNW (International Physicians for the Prevention of Nuclear War, doctors in social responsibility). She initiated the installation of “stumbling blocks” in Dietzenbach and founded in the early 90s, the “Friends Kostjukovitschi e. V. Dietz Bach, among others, sent twice a year, relief shipments to Belarus, with medical equipment, clothing, bicycles, sewing machines, computers, etc. For 20 years, are organized for children of Chernobyl recovery stays in Germany. Hospitable Dietzenbacher families rely on every summer White Russian children. The Friends has now been closed, many members and many friends in Kostjukovitschi. A number of enterprising helpers circle of friends will take care of everything, even to the collection of monetary and material donations. Since 2009, ending 23 Anniversary of Chernobyl is a city partnership. Dr. Siedentopf is married to a physician, both children have studied medicine. Her father was a country doctor, her mother a housewife and a teacher. Dr. Siedentopf welcomes us into her small rooftop apartment in early December in Berlin Pankow proximity of a park. Over tea and biscuits, she tells us about their relief activities and experiences. “The worst thing is that the organizers have learned nothing from Chernobyl. I’m speechless over the handling of the nuclear disaster in Fukushima, which is still larger than that of Chernobyl. Furthermore, the government’s evacuation zone does not increase accordingly, and women and children has not brought immediately to the south of the country in safety, one can only feel helpless rage. Instead, the population systematically lied to, they will not or are misinformed about the real dangers. This is completely irresponsible. What’s coming on now because the Japanese to diseases and problems, this is impossible. And the company policy and nuclear industry really buying into everything! Worldwide!